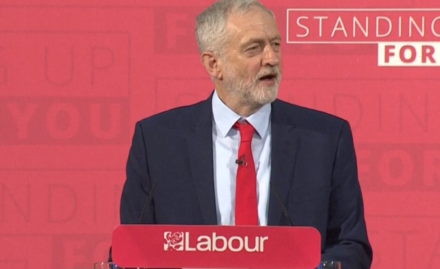 Jeremy Corbyn has put a pledge to use rent controls to tackle the rising cost of housing at the heart of his conference speech. The Labour leader said his government would give cities the power to introduce rent controls and beefed up powers in order to prevent gentrification projects. He evoked the memory of the Grenfell Tower tragedy in his keynote address to Labour’s Brighton conference, where he accused gentrification projects of serving as “social cleansing”. He announced that councils would have to ballot local residents before a regeneration scheme would be allowed to take place, if Labour is in power. “After Grenfell we must think again about what are called regeneration schemes. Regeneration is a much abused word. Too often what it really means is forced gentrification and social cleansing, as private developers move in and tenants and leaseholders are moved out,” Corbyn said. “Rent controls exist in many cities across the world and I want our cities to have those powers too and tenants to have those protections. We also need to tax undeveloped land held by developers and have the power to compulsorily purchase,” he continued. Corbyn explained his approach to regeneration saying: “So when councils come forward with proposals for regeneration, we will put down two markers based on one simple principle: Regeneration under a Labour government will be for the benefit of the local people, not private developers, not property speculators. “First, people who live on an estate that’s redeveloped must get a home on the same site and the same terms as before – no social cleansing, no jacking up rents, no exorbitant ground rents. You can read his speech in full here.